Robert W. Patch's design for his toy truck. 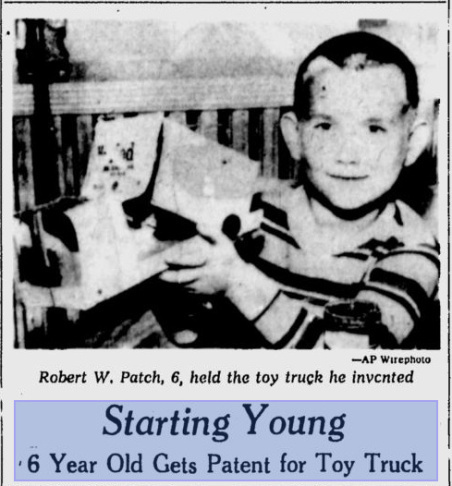 Robert Patch with the toy truck he invented. 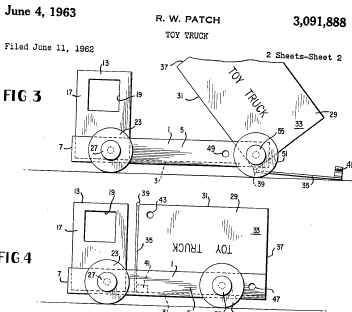 On June 4, 50 years ago, Robert W. Patch of Chevy Chase, Maryland was awarded a patent for a toy truck design. It could be taken apart and re-assembled in a variety of configurations by a child. Not so unusual, unless you consider that Robert Patch was 6 years old at the time. "It turned out I was the youngest person ever to receive a US Patent," Patch said, reached in Maryland by phone. He didn't even realize that it was the golden anniversary of his big day half a century ago, but he says it all started when he was a curious, inventive 5-year-old kid. "I took some shoe boxes," Patch said, "and some bottle caps and nails, and was making a truck." He ended up making a toy truck that could be converted into a flat bed, or a dump truck by moving the placement of the axels. His father, a patent attorney, recognized that his son's design had enough unique elements to be patentable. 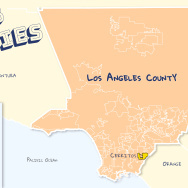 When it was granted, the younger Patch got a flurry of publicity. But he was so young, he wasn't really sure why everyone was so interested. 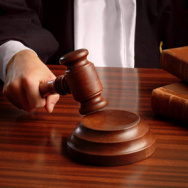 "At the time I had to sign the patent application, I couldn't write my name," he said. "So I signed it with an X." This was Robert Patch's only patent. He built a roofing business, married, had a son. 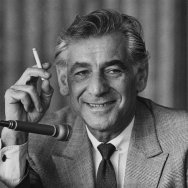 He never made any money off his invention, as his father decided it wasn't worth trying to market it. Still, there was one small reward. "US Keds was the brand on the shoeboxes I used," Patch explained. Somebody at the company saw a story about him, and saw their label on the box. So he got a new pair of sneakers out of the deal, and a little place in history. WGA List: Is 'The Sopranos' the best-written TV show of all time?